After three rounds of the 2014 NFL Draft have come and gone, the Denver Broncos have three new players on their roster, all of them coming from Big 10 (B1G) schools. "By the time we get through tomorrow, they're going to call us 'The Big Ten Broncos,'" Denver G.M. John Elway joked following the conclusion of the third round on Friday evening. The Broncos, who finished last season 13-3 before going on to play in the Super Bowl, loaded up on defense in free agency, signing defensive stars DeMarcus Ware, Aqib Talib, and T.J. Ward. After being embarrassed by the Seattle Seahawks 43-8 in the Super Bowl, Denver went into the offseason looking to get nastier on defense. That defensive trend continued into the first round of the draft on Thursday evening. Denver's first round selection, cornerback Bradley Roby, was selected 31st overall out of Ohio State. Roby, 5-11, 194 pounds, earned first-team All-Big Ten honors in 2012 and 2013. In the second round, Denver traded up with the San Francisco 49ers from 62nd overall to 56th overall to select Indiana receiver Cody Latimer. Pleased to trade up and select wide receiver Cody Latimer from Indiana. Big, fast & physical WR with a tough mentality. Elway dubbed Latimer, 6-2, 215 pounds, the best blocking receiver in the draft and noted that he—as well as Denver's two other draft picks—will compete for playing time from Day 1. Finally, the Broncos selected Michigan offensive lineman Michael Schofield 95th overall in the third round. Added Michael Schofield in 3rd Rd from Michigan. A versatile tackle who can also play guard. Tremendous upside and brings competition to OL. At Michigan, Schofield spent time at both guard and tackle before playing at guard again in this year's Senior Bowl. Elway said after the draft that the team will work with Schofield first as a tackle and then also give him work at guard. 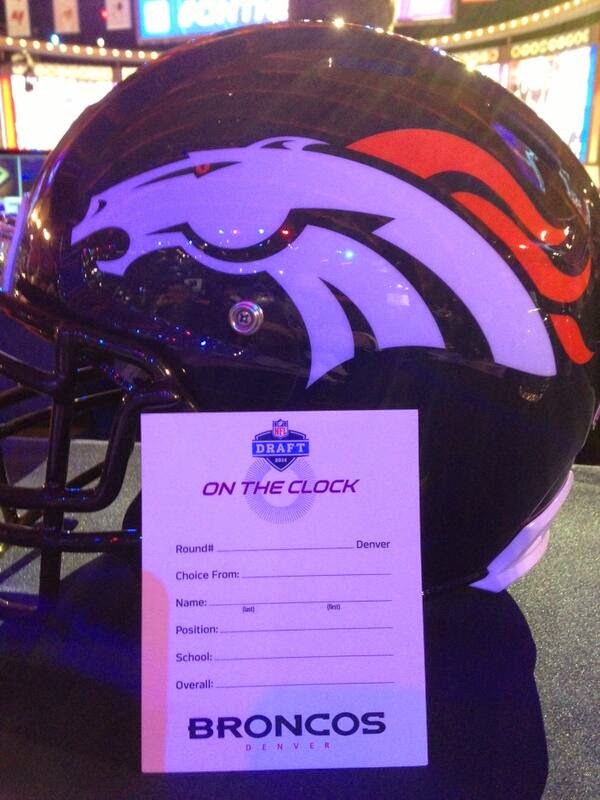 Denver has four picks remaining today, in the fourth (131), sixth (207), and seventh (242 and 246) rounds. Day Three of the NFL Draft will kickoff at Radio City Music Hall in New York at noon ET.